Initially recorded in 1979 during an archaeological survey for a N.C. Department of Transportation project, the Newland Road site consisted of three separate, remnant sections of an early 20th century brick road. Fortunately, only one section of the road was to be affected by highway construction. In 1980, Section 1 of the road was excavated and recorded by Department of Transportation archaeologists. During the excavations, several depositional layers were observed. Three of these layers were directly related to the construction of the brick road. The bricks themselves were laid in a fashion analogous to the American or Stretcher bond pattern of vertical wall construction. Portland cement was used to bond the bricks to one another. A sandy cement mortar was placed immediately beneath the brick layer. Beneath the mortar bed was a layer of grey clay fill, apparently deposited to establish a level surface for the new roadbed. A thin layer of cinders was discovered beneath the clay, and may be evidence of an earlier roadbed. On December 1, 1919, Pasquotank County officials proposed the construction of a paved highway from Elizabeth City northward to Norfolk, Virginia, via South Mills in Camden County. While the State Highway Commission considered the proposal, the Pasquotank Highway Commission began construction of the Newland Road. After fourteen months, the proposal was accepted by the State Highway Commission. By this time nearly five miles of the road had been completed. As the road was only nine feet wide, it did not meet state standards. In an effort to compromise, it was agreed that the width would remain nine feet from the northern end near Morgan's Corner to Knobbs Creek. From there to Elizabeth City, the width of the road was 16 to 18 feet. The brick road generally followed a route long established in the history of Pasquotank County, parts of which were used as early as 1770. US 17 replaced the brick road between 1930 and 1936. 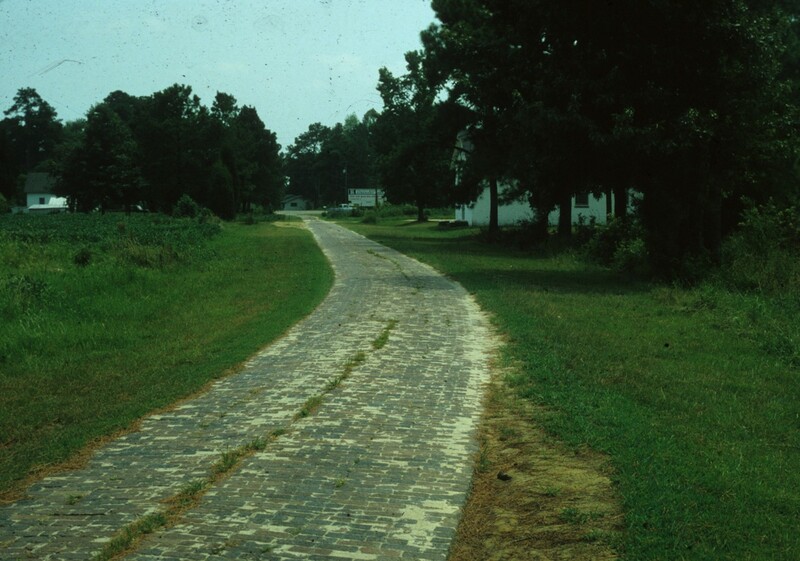 Although the Newland brick road was not unique, it and others like it contributed significantly to the early widespread use of the automobile in coastal North Carolina. In the areas where they were located, brick roads probably contributed more to the economic and social lives of the citizens than to the advancement of highway technology. While the highways would be improved in later years, brick roads bridged the nearly impassable swamplands of coastal North Carolina, opening the door for commercial development. The two remaining sections of the old Newland road in Pasquotank County represent vestiges of that county's effort to accomodate the new era of transportation, an era that brought the automobile to North Carolina and began a sociocultural transformation of the people. The Newland Road was listed in the National Register of Historic Places on April 14, 1983.